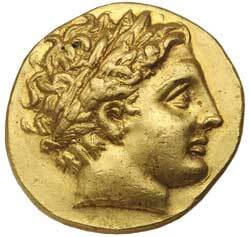 MACEDON, Kingdom of Philip II, (359-336 B.C. 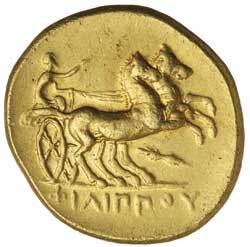 ), gold stater, (8.43 g), Pella II mint, issued c.340-328 B.C., obv. head of Apollo to right with laureate wreath, rev. galloping biga to right driven by charioteer holding kentron in right hand, reins in left hand, horizontal thunderbolt below horses, in exergue **FILIPPOU*, (cf.S.6663, Le Rider Group II cf.Pl.56, SNG ANS 130-137), Well centred, of fine style, good extremely fine and very scarce.